Which insurance policy should you use after a car accident? While auto insurance and health insurance might seem very different, the two share many traits in common. Each type of insurance is required, regulated at the state and federal level, and involves private industries. Details such as coverage options and policy procedures share additional similarities. Let’s explore health insurance vs. car insurance, starting with the main question — which covers you in a car accident? Which insurance covers you after a car accident: health or auto? Whether you're covered by your health insurance or your car insurance after a car crash depends on your current coverage levels and location. What auto and health insurance coverage do you have? If your car insurance policy covers any medical expenses, this coverage will typically kick in prior to your healthcare insurance. These coverage options — explained in depth in the next section — typically carry no deductible and less short-term cost. A deductible is what you must pay before your insurance will compensate you after an accident. Health insurance deductibles can come out to $1,000-plus. Does your state have specific insurance requirements? Certain "no-fault" states have regulations governing the relationship between health and car insurance after an accident. A no-fault state requires each driver to cover their own medical payments after an accident via medical payments (Med Pay) or personal injury protection (PIP). Depending on your state, your health care and car insurance might work together to reduce the burden on your car insurance. Generally speaking, you should use your car insurance if you already have the coverage. Speak with both your car insurance company and your healthcare provider. They will handle the situation for you based on company and state procedures. How is health insurance similar to car insurance? Auto insurance and health insurance are related primarily in that they cover medical expenses. Injury due to an accident is a common trigger for car insurance claims payouts. Depending on the location and the nature of the incident, the below coverage options may cover medical bills after a car accident. 1. Both aim to reduce out-of-pocket medical expenses. Through the coverage options listed below, health insurance and car insurance policies aim to reduce your financial liability if you're injured or sick. Liability Bodily Injury: this will cover the costs of medical expenses for the other party — or parties — if you’re found at-fault after an accident. Uninsured/Underinsured Bodily Injury Motorist Coverage: this provides medical expense coverage in the event the at-fault driver does not have enough bodily injury liability coverage or none at all. Personal Injury Protection (PIP): usually required in no-fault states, this provides coverage for medical expenses, work loss for you and your passengers after an accident, regardless of fault. Medical Payments: like personal injury protection, this provides medical coverage for the policyholder and passengers in the insured vehicle after an accident. These coverages are designed to ease the burden on the healthcare system as it relates to car accidents. Outside of this, car insurance and health care are similar procedurally — although healthcare is far more complicated. Let’s break this down. There are a few caveats to this. If you do not have a car and do not drive, you do not need car insurance. But if you own or lease a vehicle that is driven on public roads, it needs to be insured at your state’s minimum liability coverage level or above. This may change if you have a loan or lease on your vehicle. If you do, you’re more than likely required to insure it well above your state’s minimum requirements (including gap, comprehensive, and collision coverages). There are fewer options regarding participation in health insurance plans. The Patient Protection and Affordable Care Act in 2010 made healthcare compulsory. In order for your collision or comprehensive coverage to kick in, you must pay your deductible. The same applies to health insurance. For example, if you have a $1,500 healthcare deductible, the first $1,500 would be considered your out-of-pocket expense. Your car and health insurance premiums are what you pay each month. The relationship between these two in car insurance is the same as in healthcare. The lower your deductible for your healthcare, the higher your monthly premium will be. How is health insurance different from auto insurance? Car insurance and health insurance are different in a few ways. Primarily differences include the ways in which health and car insurance are governed and regulated. Driving a vehicle is considered a privilege, rather than a right or necessity. So insurers are not as regulated as health insurance companies, giving auto insurers more flexibility. Auto insurance companies use rating factors to determine premiums that could be considered discriminatory in the health insurance industry. For example, credit score. In most states, credit is a major rating factor used to assign car insurance prices. 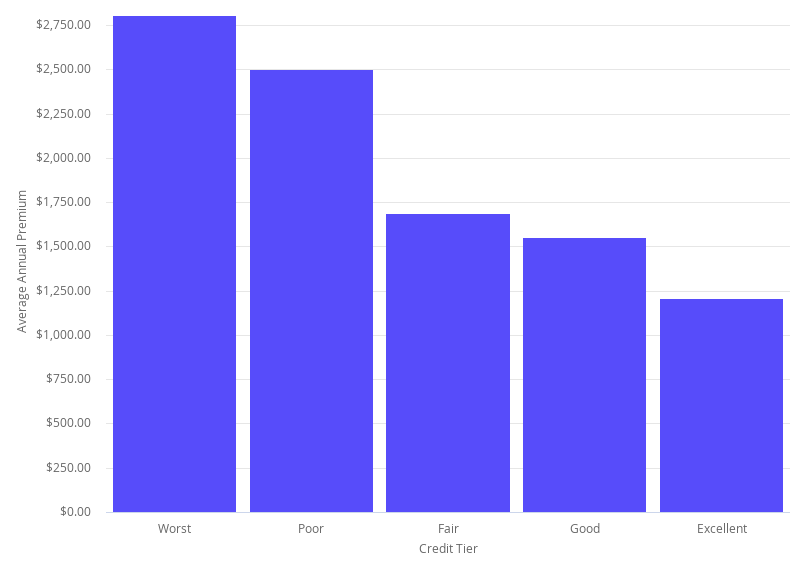 In the eyes of an insurance company, drivers with bad credit not only file more claims than drivers with higher credit, but their claims tend to be more expensive. The difference in insurance cost between drivers with excellent credit and poor credit is more than $1,500 annually. For more information on the rating factors affecting your car insurance premiums, see here. The Affordable Care Act (ACA) made it illegal to deny coverage or to charge more for pre-existing conditions under most insurance plans. However, car insurance companies can deny coverage based on driver traits and will charge "risky" drivers more than they charge "safe" drivers. "High-risk drivers" are those with claims, accidents, or other negative rating factors. Because an insurance company is obliged to cover damage a client causes in an accident, a high-risk driver is a financially risky driver. High-risk drivers are typically charged more expensive premiums or denied coverage altogether. When you turn 26, you become ineligible for your parents' healthcare plan. In the world of auto insurance, this doesn’t exist. If you live in the same residence as the policyholder — parents included — and drive the listed vehicle, you cannot be too old for a car insurance policy. Although there are many regulations on insurance rates, there is much more competition between auto insurers than among health insurance companies. If your current car insurance company increased your rate after an accident, you can easily shop around with different companies and potentially find a better price. Changing health insurance companies can be a little more complicated. Oftentimes you’re stuck with what your employer offers. Although car insurance and health insurance differ in many ways, their overall objectives are the same. Healthcare and car insurance were both designed to reduce medical expenses. Let’s explore frequently asked insurance questions to see some bigger themes of car insurance vs. health insurance. Do you need health insurance if you have car insurance? Yes. Even if you live in a no-fault auto insurance state, you’re still required to have healthcare. Your medical coverage within your car insurance policy will only apply if you’re injured in a car accident. You will be without coverage if you were injured, sick, or disabled otherwise. This depends. Generally, the at-fault driver’s car insurance would provide medical benefits via their bodily injury liability. If the other driver does not have insurance or sufficient insurance to cover the damages, your uninsured motorist bodily injury coverage can help. If you do not have this coverage, you might have PIP or medical payments which can also be applied. If none of these are options but you have healthcare, you should be able to use that. It is rare that a health insurance policy would not provide coverage against a car accident.